Ire looking to improve the performance of your business or deploy new technologies, understanding what you need to consider puts you in the drivers seat. 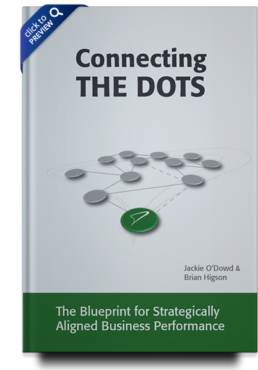 Connecting the Dots is your blueprint for a better business. Our proven, commercially-focused consulting process will empower you to get your key enablers – People, Technology, Process and Information – all aligned and working together towards the common goal: realised potential & success. If you are about to embark on a new project, implement new systems, or if your current project has lost its way, Connecting the Dots will give you the tools you need to make it a success. Follow the blueprint and you will have clarity on the areas of your business that need to be improved to meet strategic goals. You will also be able to develop a roadmap to where you want to go, and what needs to be done to get there. By considering all aspects of your business, you will be in a better position to compete, whether it is collaborating with your team, managing your customer relationships or building better teams – you will have the edge in business by connecting the dots. If you read one management book this year read this one. The business and systems knowledge you gain from reading Connecting the Dots is equivalent to years of hard earned experience. The more you know the less you fear. Very few business books are full of common sense. Connecting THE DOTS is an exception. Each chapter is full of sound process, succinct techniques as well as practical tips to allow differing businesses to address stand-alone business challenges or more complex organisational re-engineering. The fact that it can be read and considered in “chunks” will be of immense value to corporates in today’s tough economic times. If you are in business, then Connecting the Dots is for you! A Business management and strategic framework that we can understand. The performance framework was a valuable tool and process to provide a pathway for consolidating our disparate IT technologies into a focused set of tools that complement each other – thus reducing system noise and complexity.